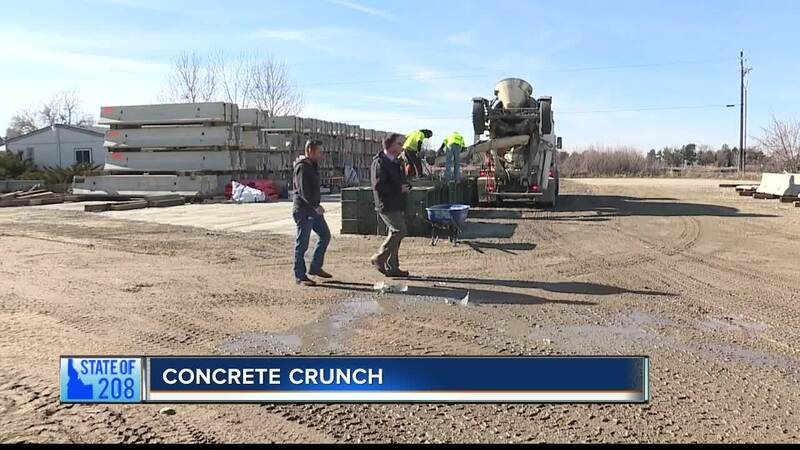 Interstate 84 has gone through a number of transformations over the years, and the Idaho Transportation Department is ready to embark on a major expansion in Canyon County. An expansion that will determine how fast drivers can get through the Treasure Valley. Railco started back in 2013, serving the Idaho transportation construction industry, specializing in concrete guardrails, and cable barriers. And now six years later, the relatively new business is trying to keep up with the concrete crunch. When Kevin Wade started up Railco he had no idea how fast his business would take off. "Since 2013 when the company started we've tripled our sales volume in the last five years and now we're scheduled to quadruple our sales," Wade said. Wade will competitively bid on the work in Canyon County, but already a vast majority of Railco's work is with the state of Idaho. Wade added, "about ninety percent of what we do is for the Idaho Transportation Department and the rest is with federal highways." And believe it or not, Wade credits local politicians for looking down the road. "Even our state legislators understand transportation is vital to our economy and in 2017 just around 300 million dollars in Garvee funding went to widening I-84 and places up north along Highway 95. They understand transportation is a good investment," Wade said. So the next time you're driving down the interstate or up north, remember those concrete barriers and metal guardrails are there to protect all of us. And if the state of 208 keeps going the direction it's going, Railco will try and keep pace with the concrete crunch.